Early morning stroll for the American Bison. Yellowstone is perhaps most renown for its grand landscapes, but its the animals here which makes it one of (if not the) premier North American national parks. 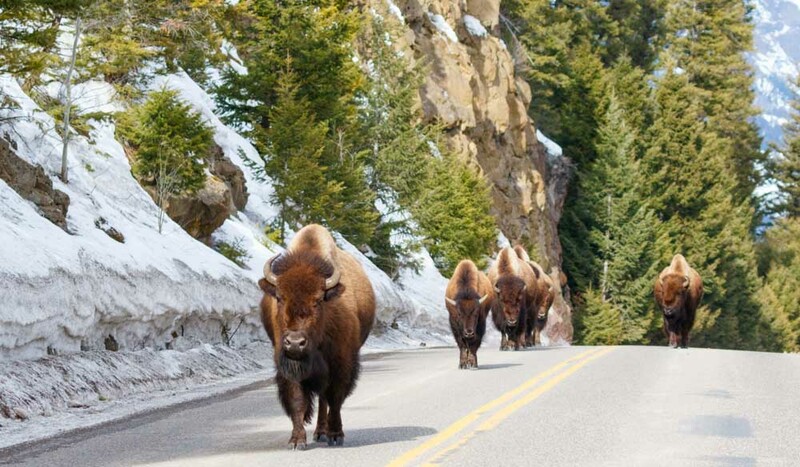 Here is your Yellowstone ‘Big 5’ wildlife list to tick off. 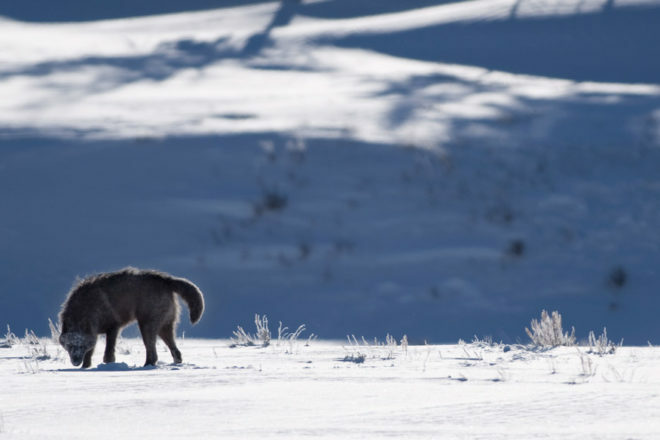 European settlers had eradicated wolves from Yellowstone by the 1930s, and for the rest of the century the strange side effects of removing the predator started to appear. 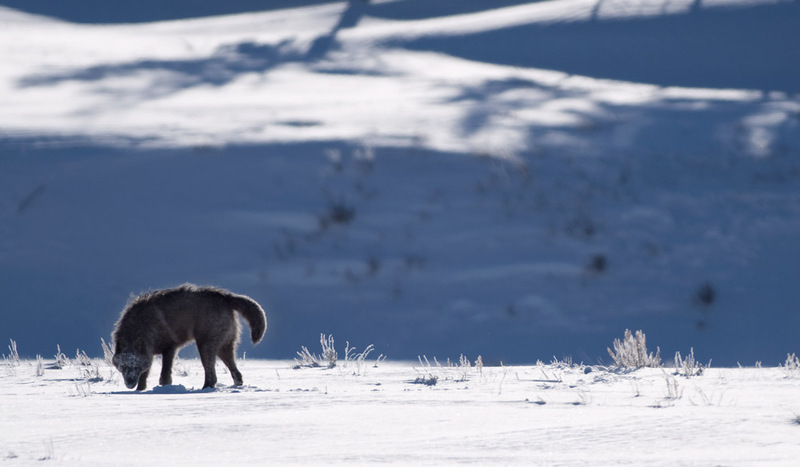 Tree species like willow declined; without wolves to keep elk numbers in check, too much flora was being consumed. This reduction in plant life then meant that beaver numbers declined, willow being a food source, as well as various insect and bird species. Following a reintroduction of wolves in 1995 and an ongoing effort to establish packs, the sound of a beaver slapping its tail on the water to warn of an approaching wolf pack has made a welcome return to the park. The largest herd in the States can be found in the park, an icon of North America, and its biggest land animal. They migrate to Yellowstone’s lower ground in winter and are fed upon by wolves and grizzlies. If disturbed they can be aggressive and weighing up to 900 kilograms, you don’t want to get in their way. A threatened species, Yellowstone is one of the best places to see this fearsome predator, the males of which can weigh up to 317 kilograms and easily outrun Usain Bolt. So there’s no point in making a run for it if one approaches. If you’re going for a hike in the park you’ll need bear spray for protection, but you may also be lucky enough to see one from the road at places like Hayden Valley. There are about 800 of these unusual-looking animals ranging between Grand Teton and Yellowstone National Parks. The largest member of the deer family lives in the marshy land near lakes and rivers, with specially adapted legs and feet to help bear its weight on unstable ground. The USA’s national animal flies here. The birds can stand 114 centimetres tall with a wingspan of up to 2.3 metres and hunt small animals and scavenge on elk and bison carcasses. Successful nationwide conservation saw the bird taken off the federal endangered list in 2007.